Fire up your taste buds and try our red-hot Tapatio® variety with a hint of lime! We’ve combined select cuts of premium chunk light tuna with the world-renowned Tapatio® hot sauce made from authentic ingredients and flavors. 14 grams of protein and 70 calories per single-serve pouch provide a smart (and spicy!) boost of protein to enjoy in any salad, wrap, or right from the pouch. Packed in our no-drain, flavor fresh pouch, it’s easy to take anywhere and eat anytime. 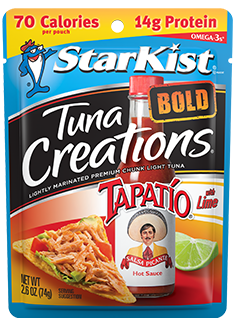 ++ StarKist Tuna Creations® BOLD Tapatio contains 110mg of EPA and DHA omega-3s per pouch combined.